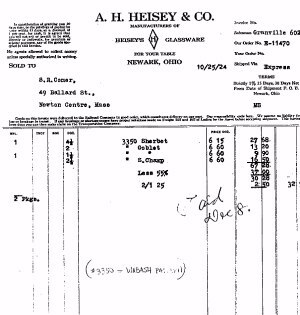 This segment about Heisey Glass is somewhat different from most of our others on the 101 site. When Bob Smith contacted us with photos of some tumblers he knew to be of Heisey origin, he had already read what is offered in the history portion of our Heisey - Part 1, and felt that he could (with time and proper contact with some men he had known in past years) ascertain the derivation of some iridized tumblers, known to be of Heisey origin. The partners names were George Fogg and Frank Maloney. 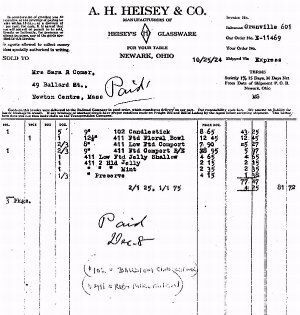 George was heavy into glass research and most important, was the President of the National Heisey Glass Collectors. He was the one who told me the story about the iridizing lady. The glass she left was not in barrels, but in boxes. It was shipped to her in barrels, which was the shipping method of the time. I left my phone number and they will need some days to refresh their own memories, but they will get in touch with me. They did confirm the glasses in the boxes and the $5.00 per box. It turned up in Brimfield (where they both saw it) and then I remembered that was where I bought five of the iridized Heisey Colonial Juice glasses. 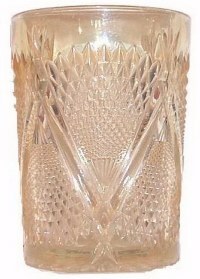 I do have another tumbler that I found while they still had their shop, which Frank Maloney said he was sure is called Heisey's “PLAIN and FANCY” tumbler. They had a Heisey pattern book on hand and I saw that the pattern was indeed in the book. This one was written up by Britt after I sent him a photo. Now it's a matter of waiting for them to collect their memories. Heisey COLONIAL pattern. Iridized by Sara Comer. 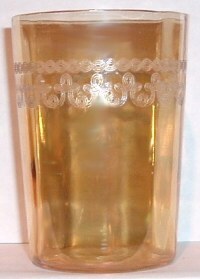 It does have the Diamond H.
Heisey PLAIN & FANCY pattern. Iridized by Sara Comer. Heisey WIGWAM in light marigold. Photo Courtesy Don Kime and Jerry Kudlac. 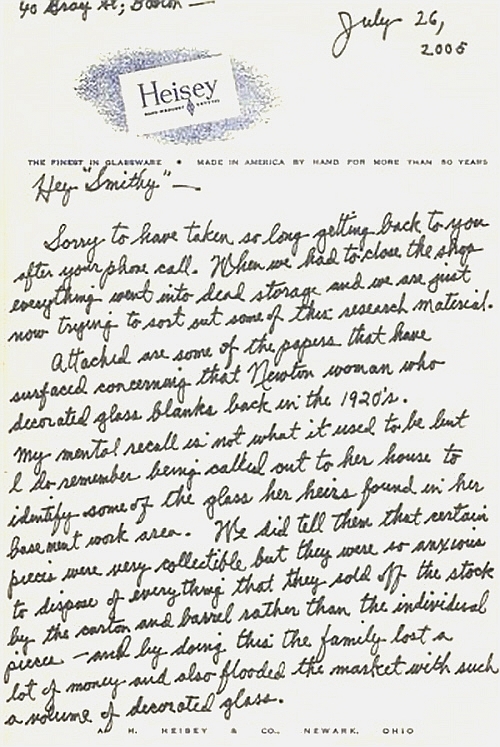 A letter from Bob Smith dated July 8, 2005 relates an interesting bit of history surrounding enameled items. It was explained to me years ago how different enameled items appeared on such tumblers as the Heartband, including those that were souvenirs, having town or city names on them. A lady here in Massachusetts owned what she called a “salesman's sample kit”, which had several carnival items in it, including a Heartband tumbler and a Near Cut tumbler, some mugs and a few smaller pieces. A “traveling salesman” would bring this kit with him as he traveled from town to town in a section of the country (seems each salesman had their own sales territories, consisting of several states. (New England was considered one territory.) It was their job to talk the locals into buying their merchandise, which the salesman would then have “printed or painted” with whatever the buyer desired; be it a souvenir with the town name or whatever. 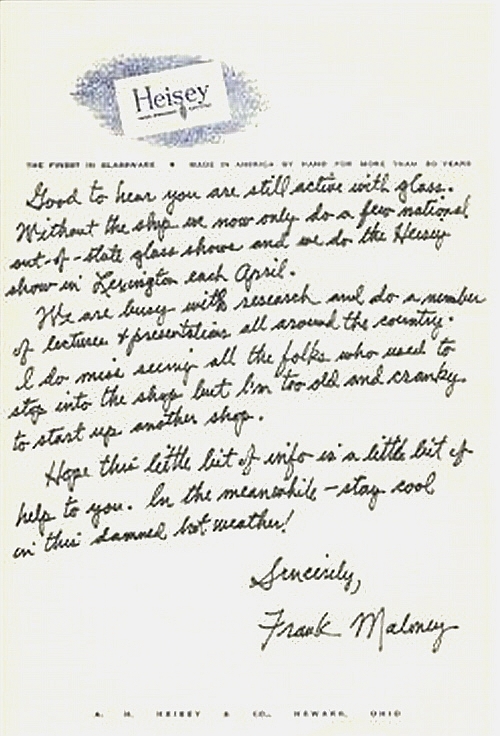 There was a little leaflet in the kit which had the glass printer's name and address, along with a couple of paragraphs of what they could provide. The lady believed that each salesman had his own “printer” and received a commission from him. It was a really interesting kit! Lord knows where it is now? 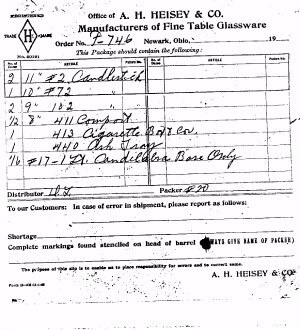 This leaves me wondering whether the glass companies may have had their own salesmen who went out seeking businesses to purchase their carnival glass with their business names on, which eventually became our coveted carnival glass advertising items? Note: Booths for inscribing names on these ruby flashed pieces were set up at places like the Ohio State Fair during the 1940s-50s. A small glass box with ruby lid was purchased for me with Diane in script, while attending that Fair in 1942 in Springfield, Ohio. The style of the box was art nuveau, having small projecting feet. 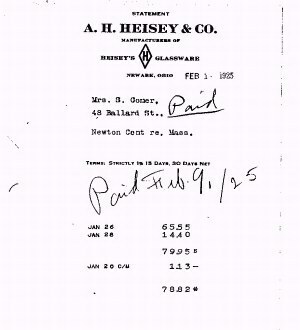 Just received an envelope with a two page note and six pages of Heisey invoices of items sent to Sara Comer. I was right with the name the first time - it is Sara Comer. I am scanning the 2 page note and attaching it to this letter. I'm not sure this is going to work, so I will hold off scanning the invoice pages. Let me know if you can read these and I will scan the invoices. 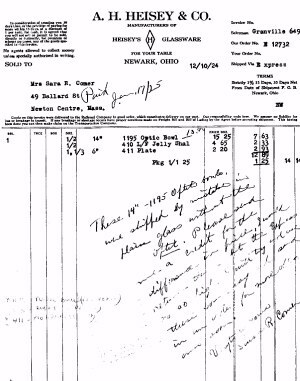 The dates on the invoices are 1924 and 1925. 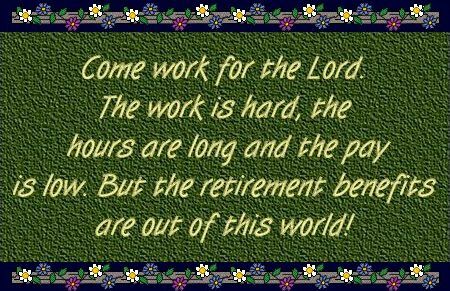 - This gives rise to a thought. 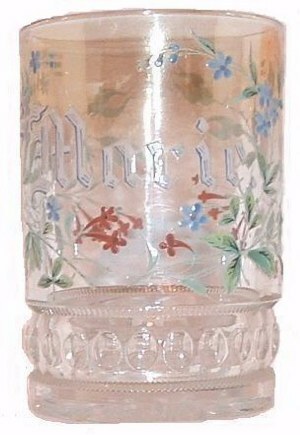 They were still making carnival glass during this time period. 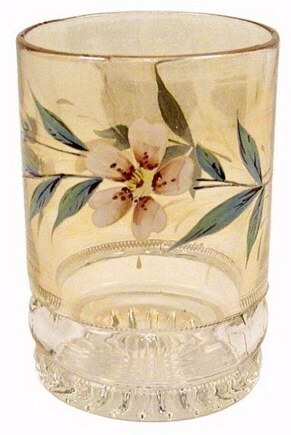 Mrs. Comer was not deliberately iridizing glass to deceive people as some folks do nowadays. She could only have been making a small amount of money from each piece she iridized. Technically, we could say she was a maker of original carnival glass, although she did not make the pressed glass herself. 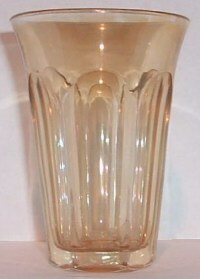 Her iridized glass is at least 80 years old now. 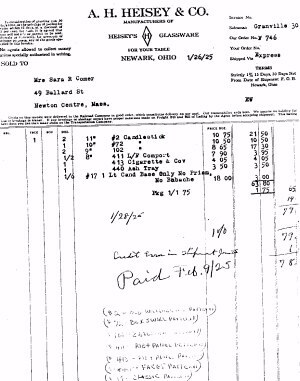 Note: The attempt at scanning the invoices was not successful, so Bob mailed copies of the invoices. Some of the detail was lost in the process, but Dean took photos of each one. They are here for your appraisal. We believe you can read enough for verification of Sara Comer's “sideline”.